ontextual ads are often displayed to the right or left of website copy, or as blocks within sections of the text. The ads shown are related to the content of each individual page. As visitors click on these links, you earn cash. Probably the largest and most used of the contextual ad programs is Google's Adsense. Google really is a giant when it comes to the Internet, and their talents go far beyond just being a search engine. 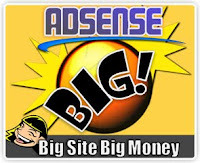 Adsense is used by many site owners to bring in a monthly income. If you're interested in running Adsense ads, first you'll need to apply and get approved. Once approved for one site, you can place Adsense on any other site that you own. You can decide to run only text ads or choose from image and text. Various sizes are offered, and you can custom select colors to match the look of your site. Once the code is generated, you paste it on your HTML pages where you want the ads to appear. Simple & easy. But what happens if you're not approved by Google, or for some reason your Adsense account were to be terminated? What would you do then? There are other ad network options out there and I've gathered some of the best alternatives together here. Once your site is approved, you insert the code on your page and they sell simple text ads that appear on your site. You have final say over any ads being published. Payments are made via Paypal or Clickbank. You receive 50% of the sale price for each link they serve up. This ad network is acceptable to be run on the same page as Google Adsense as this is not considered contextual advertising. A variety of ad formats to choose from. You can run text ads, banners, inline ads or even full page ads. You can choose to approve or reject ads before they appear on your site. Pays monthly with the default minimum check amount of $100.00. Once your site is approved, ads will appear within 24 hours of your pasting the code. Adbrite has no policy against using other ad networks on your site at the same time. Contextually relevant ads and ad units which are linked to keywords on your web page. Ads displayed will match the content of your site. For your website to be approved it must be in English, be content rich with more than 50 words per page. You can run text, image, billboard, and video ads. Quigo offers content-targeted advertising to those with strong traffic. Publishers with 500,000 or more monthly page views are encouraged to apply. Once approved, simply copy and paste the code. Works very similar to Google's Adsense program. You design your own ads, choosing colors and formats, then paste some code on your page. You'll be paid per click. Advanced ad targeting and display capabilities can sometimes improve your results. You can choose to be paid via Paypal once your earnings are $50.00, or a check when you hit $100.00. A full service online ad network which serves over two billion monthly impressions across more than 30,000 websites. Chitika ads are not contextual and can be run on the same page as Adsense. Twenty-four different ad sizes are available. Payment is via Paypal once your account is at $10.00, or a check when you reach $50.00. Miva offers a wide variety of ad formats to choose from: content ads, inline ads, search ads. You'll be paid on a per click basis. Payments are made monthly by check or Paypal once your balance reaches $25.00. You can also block competitor ads from appearing on your site. A different type of ad network which allows you to display affiliate ads in an "Adsense Style". You can run Clickbank and Paydotcom text ads on your site or blog and earn up to 75% commission. Display text ads on your website and let advertisers bid against each other. Ad formats are skyscrapers, banners, rectangles, buttons. They even have ads for your RSS feeds. Payout is monthly via Paypal once your balance is $10.00. This one pays on a cost per click basis. This service allows you to create Google Adsense styled ads for Amazon products. Different ad formats are available which makes it easy to integrate into your site. Amasense can also be used side by side with Google Adsense without any problems. As ads are clicked on, you earn a percentage of the product which is paid by Amazon depending on the type of product that is bought. You must have an Amazon associate account first before signing up. To get one go to https://affiliate-program.amazon.com. As you can see Adsense is not the only game in town when it comes to running ads on your site. If you have multiple sites, you may want to use one of the services mentioned above, then test, to see which one is a better earning opportuníty. You might be surprised at what you learn. It's against Google's terms of service to run another contextual ad service on the same page as Adsense, but there are exceptions to the rule. Most of the services above will tell you if you can run their ads alongside Adsense. If your websites are mainly information based, network advertising is an excellent way for you to earn an income with little effort on your part. No matter if you use Adsense or another service, it just makes for good dollars and cents. About The Author: Merle's Mission Blog - "Rants, Raves and Random Acts of Kindness" a self proclaimed "Internet Junkie" with a passion for net marketing, affiliate marketing, social networking. An avid Blogger and writer with several niche sites to her credít.